One of the main ingredients in Mother’s Special Blend is coconut oil. In addition to providing an appealing and gentle scent, coconut oil heals, protects and beatifies the skin in a couple major ways. Protects against damage. Coconut oil both softens the skin and protects against damage. It does this by preventing free-radical formation and protection from free radicals. It aids in prevention of blemishes. Helps skin heal and repair. Coconut oil helps the skin heal and repair. It does this by aiding in removal of dead skin. As dead skin falls away, the coconut oil is better able to penetrate deeply to soften and strengthen the skin layers. Keeps skin supple and strong for a youthful look. Coconut oil is absorbed into the cell structure of connective tissues. These connective tissues give our skin strength and elasticity. Coconut oil keeps them supple and prevents sagging or wrinkling. Through its use, skin can become more evenly textured and exhibit a healthy shine. 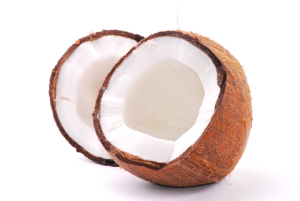 Coconut oil is absorbed into the skin and does not wash away when bathing like water or vegetable oil based lotions. It does not leave a greasy feeling. Mother’s Special blend has incorporated coconut oil into their products and mothers have been using and benefiting from these now for 35 years.